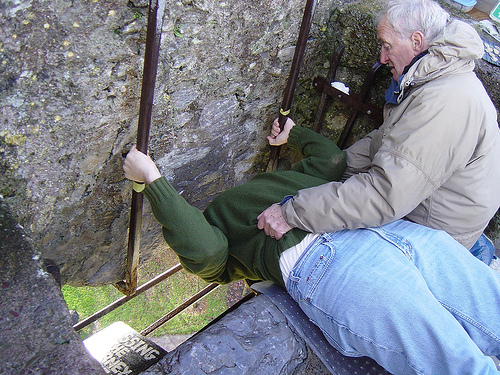 There are two versions of how Ireland’s Blarney Stone came to have its power, and two versions of its true location. Now, here we are, at the present: Sir Charles Colthurst, current owner of the County Cork Blarney Castle, says the oft-smooched rock is in the exact place it has always been, and that it is the real-deal. To the archaeologists who say it is in a different part of County Cork, he says, “That’s plain Blarney!” We believe him. The second version is more spooky. Some believe that a magic stone was built into the castle in the 1400s, but no one knew its exact spot. Then, the castle owner found a witch drowning in the river and saved her. She told him where the magic stone was, and that anyone who kissed it would be given great powers of persuasion. In fact, both stories could be true. McCarthy did persuade the queen, although it was in utter frustration, to expect nothing from him and nothing was what she got!